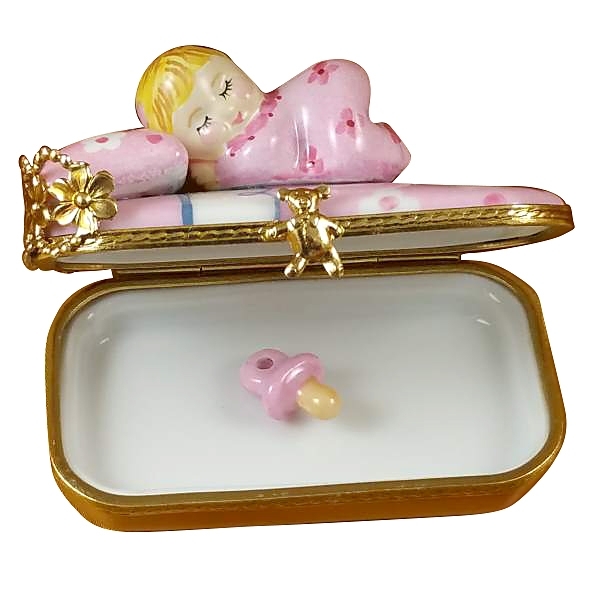 BABY IN PINK BED WITH PACIFIER - Limoges Boxes and Figurines - Limoges Factory Co. The Limoges trinket box has a very endearing shape. It is shaped like a pink baby bed on which sleeps a baby in the characteristic cute pose. The peacefully asleep baby figure will fill any mother’s heart. The whole bed forms a useful trinket box. A removable pink pacifier comes with the box. This Limoges box is a décor piece for your nursery and at the same time it can also be used as a gift article. Measurements: 3" х 1,5" х 1,75"